This was L’Opéra Harmonique’s first production at Opéra de Rouen. It is a singularly thought-provoking take on Purcell’s famous piece. The extended duration is due to various inserts along the way in the manner of the period. The orchestra, using period instruments, is wonderfully polished throughout, making the pointed dances a particular delight. Here, the sea is the ‘matrix of the action’, to quote the booklet notes. As a “reflection of the protagonists’ souls”, it shadows the fluidity of the action and the characters’ response to the travails of doomed love. Cécile Roussat and Julien Lubek have done a sterling, hyper-imaginative job of direction, choreography, sets and costumes. The stage deliberately seems to invoke the mythic, a magical time before ours, artificial in its immediate effect but, via this distancing, allowing the core emotions of the drama to shine forth. The production sets out to depict all characters involved in the action, even those merely mentioned in the libretto (like Diana). Also Cupid draws his bow in stylised movements onstage during the course of the dramatic and beautifully expressive Overture. The excellent choir is offstage throughout, a disembodied Greek chorus capable of the greatest delight as well as the deepest pathos (“Great minds against themselves conspire”). Replacing them onstage, perhaps, are the dancers and acrobats. Prepare for a raft of the interpolations mentioned above; gird yourself for example, also for trapeze artists, swing from the ceiling as the lovers’ hands seek to touch, a scene that moves effortlessly into “Let the triumphs of love and of beauty be shown”. Vocally, the first thing to note is that this international cast delivers the English text astonishingly well. As much care has gone into diction as has been lavished on any other performance aspect and indeed on the production. 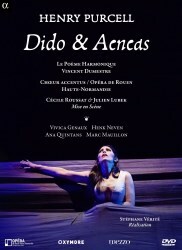 The Dido is Alaskan soprano Vivica Genaux, stunning in her expressivity and decidedly feisty in her final scene with Aeneas. Yet she is truly touching in her Lament, beginning with her arms fully extended as if to reflect the length and beauty of her phrasing. Finally, she is enveloped by the sea, the sea that has provided such a powerful metaphor throughout. At last, also, we the DVD viewers see the chorus, now in the orchestra pit. Feathers fall at the end — traditionally a sign of angelic presence – is this the reference? Portuguese soprano Ana Quintans is a fresh-voiced, charming Belinda, wondrously nimble at “Haste, haste to town”. Perhaps the surprise is a male singer for the part of the Sorceress, a high baritone, Marc Mauillon, who also takes the role of the Sailor. The use of a male voice was suggested by a 1706 prompt book, and 'hir' (to use a conflation of “his” and “her”) scenes are augmented by dancers. S/he is a sort of camp octopus. Don’t buy the DVD on this information alone, but I admit that it sounds intriguing. As Aeneas, Henk Neven is vocally superb although perhaps his stage presence does not quite suggest Aeneas’ magnetism. However, this is altogether a most fascinating DVD, superbly performed. The camera-work is good, if not excellent — sometimes sudden close-ups can seem rather random. Not by any means your run-of-the-mill Dido, but for those that already own the William Christie Glyndebourne on Opus Arte (or that same conductor’s version on Fra Musica with Hilary Summers), or Hogwood’s ROH DVD (Orchestra of the Age of Enlightenment with a cast that includes Sarah Connolly), this DVD still acts as a necessary complement.